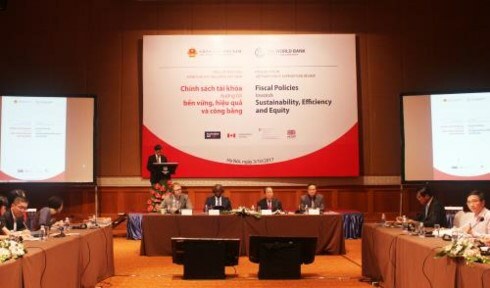 Hanoi (VNA) - The World Bank and the Government of Vietnam on October 3 launched a joint report titled “Vietnam Public Expenditure Review (PER): Fiscal Policies towards Sustainability, Efficiency, and Equity”. The main purpose of the assessment is to inform fiscal policy decisions and reform action plans of the Government, particularly in meeting growth, poverty reduction, and global integration objectives. The PER was undertaken by relevant agencies of the Government of Vietnam, led by the Ministry of Finance in collaboration with the Ministries of Planning and Investment, Education and Training, Health, Science and Technology, Agriculture an Rural Development, and Transport, other relevant central government agencies, and selected cities/provinces, including Lao Cai province, Hai Phong City, Quang Nam province, Ho Chi Minh City, and Can Tho city. The review saw WB and international organization experts' contributions to the analysis and recommendations, in particular through sharing international experience and information on global trends and good practices in public financial management. On the basis of a comprehensive analysis of revenue, expenditure and borrowing policies in Vietnam during the 2011-15 period, the PER identifies state budget revenue and expenditure trends over the past years, highlights achievements and points to areas for potential improvement, key fiscal challenges, and strategic directions on fiscal consolidation, and fiscal policy and governance reforms, in the short, medium and long terms in Vietnam. The review is undertaken as Vietnam is experiencing emerging fiscal challenges, including narrower fiscal space, rising public debt and concerns about the medium-term sustainability of the current fiscal position. State budget revenue mobilization, particularly from tax and fees, as a percentage of GDP has decreased, whilst public spending needs continue to grow. In addition, the rapid pace of expansion, openness and decentralization has made the economy more complex to manage. The review aims to provide empirical evidence to answer three main questions: (i) how to create the fiscal space whilst ensuring fiscal sustainability; (ii) how to best align public spending with national priorities; (iii) how to strengthen accountability for results so that public spending has the greatest impact. Being the first joint review in 10 years, the PER comprehensively covers 15 specific chapters, including 5 cross-cutting topics, 5 heavy-spending sectors (which account for almost 50 percent of total state budget spending), and 5 provincial chapters; and an Overview that consolidates key messages across the chapters. “In order to ensure fiscal sustainability, the National Assembly of Vietnam has issued a Resolution requiring the reduction of fiscal imbalances and thereby of budget deficit to 3.9 percent of GDP during 2016-2020 and no more than 3.5 percent in 2020," said Do Hoang Anh Tuan, Vice Minister of Finance. "Achieving these targets will require concerted efforts to boost revenue mobilisation, restructure and enhance efficiency in spending, and strengthen the management of public assets and liabilities, and of fiscal risks – at both central and local levels,” said Tuan. “We are pleased that this report provides concrete recommendations on policy options in these regards,” he added. “This PER comes at a critical juncture when Vietnam faces important fiscal choices. We hope that the report has been providing a useful analytical foundation for the Government and relevant stakeholders including the National Assembly, in further developing its medium-term development, fiscal and budget plans and priorities,” said Ousmane Dione, Country Director of the World Bank in Vietnam. “This process of joint review is in many ways as important as the report itself. Because it is only through our dialogue that analysis and ideas can be transformed into action, policies and real results. Going forward, it will be important to ensure that the knowledge gained is spread to a wider audience, through effective dissemination activities starting with today’s launch, and follow-up engagements be taken on the implementation of the recommendations," he said.